Alternative Classroom Learning Experience (ACLE) is a project of UP Diliman University Student Council in collaboration with student organizations as a platform for the studentry to conduct classes as a collective response for pressing sociological, political and cultural matters. 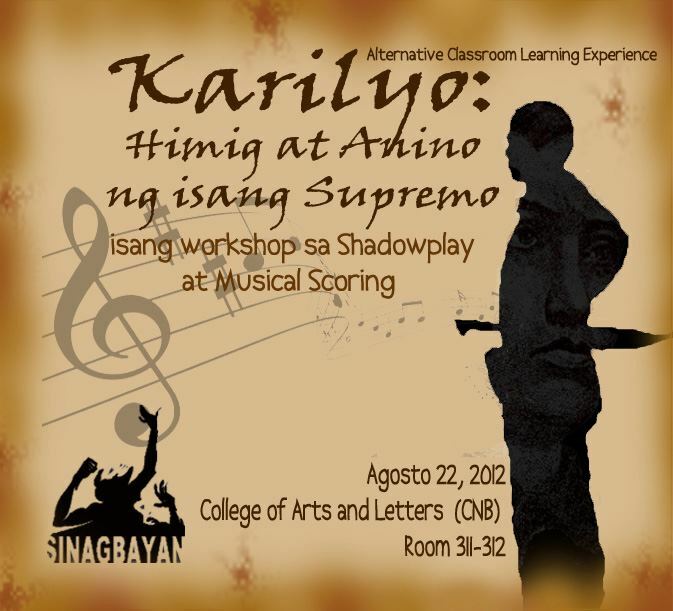 This entry was posted in Awit at Musika, Palihan, Teatro and tagged ACLE, Afternoon, Alex Remollino, alternative class, Andres Bonifacio, anino, Anino Shadowplay Collective, Art, Art of War, Asian theater, Bienvenido Lumbera, BLKD, Bobby Balingit, CAL, CARP, Chikoy Pura, cultural fascism, Cultural Imperialism, cultural industry, cultural work, Datu's Tribe, Ellen Ongkiko-Marfil, Eric Cabring Cabrera, fliptop, GARB, gawaing pangkultura, Hacienda Luisita, himig, HLI, HLI massacre, imperialism, Kahir, karilyo, Katipunan, Kjah, KKK, Lanceta, Mideo Cruz, Ms. Saigon, musical scoring, Organization, Orlando Castillo, performance art, Philippine, Philippines, political joust, puppet show, Raya Martin, Ricky Lee, Sa Ngalan ng Tubo, shadow play, sining, SOCA, state of culture and arts, supremo, The East is Red, The Jerks, The Wuds, University of the Philippines, UP Diliman, UP Diliman University Student Council, Vietnam War, visual artist, Visual arts. Bookmark the permalink.